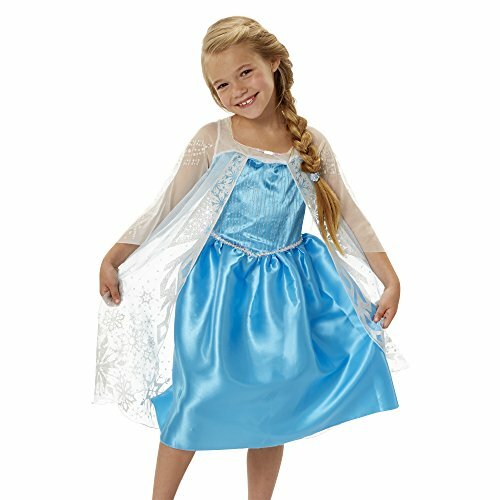 Frozen Disney Frozen Elsa New Blue Dress | What Should I Say? Look enchanting in Elsa's iconic blue dress from Frozen! This beautiful, satiny dress features a white glitter print on the skirt in a snowflake pattern. The dress's bodice is also decorated with a glitter design and features a magical Elsa cameo that swivels open to reveal a secret picture! A gorgeous white cape completes this dress with an intricate glitter snowflake design to complement the pattern on the skirt. You'll love this beautiful Elsa dress! If you have any questions about this product by Frozen, contact us by completing and submitting the form below. If you are looking for a specif part number, please include it with your message.